Prime Minister Hun Sen on Friday reiterated his stance that Cambodia is free of political prisoners, that the courts are independent of political interference and accused unnamed persons of pushing him to potentially break the law by asking him to free prisoners—a power that was beyond his ability. Addressing nearly 1,000 students, farmers and government officials at a land-titling ceremony in Preah Vihear province, Mr. Hun Sen also told NGOs and politicians that land conflicts would continue if they intervened, and blamed the media for painting a bad image of the country. Returning to issue of political prisoners, which was raised by visiting U.S. President Barack Obama on Monday during bilateral talks with Mr. Hun Sen in Phnom Penh, the prime minister said there was no such class of inmate in the country’s jails. Mr. Hun Sen also added that Cambodian courts—widely accused of being subservient to the ruling party—are independent and that the rule of law is strictly adhered to. “As I have already informed, Cambodia has no political prisoners, but there are politicians who have been found guilty of crimes,” he said, without naming any politicians in particular. 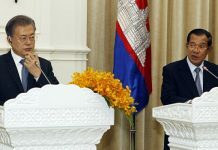 Mr. Hun Sen also said that he had been pushed to intervene in the court system to ensure the release of a prisoner. Though Mr. Hun Sen did not mention whom it was that had exerted such pressure, Mr. Obama on Monday raised the need for the release of political prisoners with the prime minister. They “wanted me to intervene,” Mr. Hun Sen said. “There were suggestions that I intervene to release prisoners. If I did so, I would be what you have alleged,” he said. “You alleged that I was in control of the court, an institution that has its own independence; that would be asking me to commit against the law,” he continued. As an example of the court’s independence, Mr. Hun Sen noted that a number of senior officials from the military police, police and government officials from the ruling CPP have been convicted and imprisoned on various criminal charges. On the issue of land disputes, Mr. Hun Sen warned that if NGOs or political parties get involved, the disputes would remain unsolved and actively stalled. “I send the message from here that I will not resolve and will stall [the land issues] whenever there is involvement from politicians, non-governmental organizations or political parties,” he said at the ceremony, during which 577 families were presented with 900 land titles covering 1,979 hectares of land. “That is why I say that they should not get involved with politics if [they] want me to resolve the land issues,” Mr. Hun Sen said. 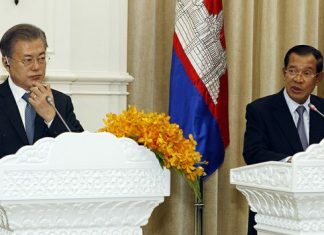 Rounding off his hour-long speech, he also lashed the media for not publicizing the government’s achievements in providing land titles for villagers, projecting instead a negative image of Cambodia around the world. 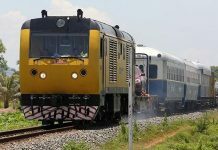 “I told [foreign visitors] that there are two Cambodias: One Cambodia is in the media and other Cambodia is the real Cambodia. “Cambodia in the media is a hell, while the real Cambodia is whatever you have seen, a place where there is no prohibition on the rights of movement,” he said. Independent political analyst Lao Mong Hay said that reports released by U.N. human rights envoy Surya Subedi, which deal with land disputes, freedom of expression, and electoral reform, also highlight the weaknesses of the judicial system, which is under the influence of the rich and powerful. “Whenever the court is under the power of politicians, the case files and persons convicted by court must be politically related,” he said.